This morning I came across an article in the Guardian, Africa must build industrial sector urgently, warns UN agency, and the timing could not be better. I’m in Guangzhou, China, marketplace for the world, and if you ever needed a reminder that manufacturing is what creates jobs and wealth and leads to real economic development, come here and look around. I am posting an article from The Guardian. This news is a stark reminder that the “resource curse,” is not just a problem of bad governance and corrupt politicians. The oil giant Shell claimed it had inserted staff into all the main ministries of the Nigerian government, giving it access to politicians’ every move in the oil-rich Niger Delta, according to a leaked US diplomatic cable. The company’s top executive in Nigeria told US diplomats that Shell had seconded employees to every relevant department and so knew “everything that was being done in those ministries”. She boasted that the Nigerian government had “forgotten” about the extent of Shell’s infiltration and was unaware of how much the company knew about its deliberations. The cache of secret dispatches from Washington’s embassies in Africa also revealed that the Anglo-Dutch oil firm swapped intelligence with the US, in one case providing US diplomats with the names of Nigerian politicians it suspected of supporting militant activity, and requesting information from the US on whether the militants had acquired anti-aircraft missiles…. Campaigners tonight said the revelation about Shell in Nigeria demonstrated the tangled links between the oil firm and politicians in the country where, despite billions of dollars in oil revenue, 70% of people live below the poverty line. 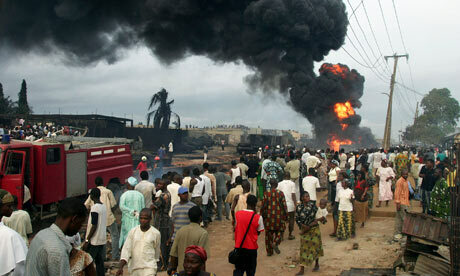 Nigeria’s agony dwarfs the Gulf oil spill. The US and Europe ignore it. The Deepwater Horizon disaster caused headlines around the world, yet the people who live in the Niger delta have had to live with environmental catastrophes for decades. We reached the edge of the oil spill near the Nigerian village of Otuegwe after a long hike through cassava plantations. Ahead of us lay swamp. We waded into the warm tropical water and began swimming, cameras and notebooks held above our heads. We could smell the oil long before we saw it – the stench of garage forecourts and rotting vegetation hanging thickly in the air. The farther we travelled, the more nauseous it became. Soon we were swimming in pools of light Nigerian crude, the best-quality oil in the world. One of the many hundreds of 40-year-old pipelines that crisscross the Niger delta had corroded and spewed oil for several months. That was the Niger delta a few years ago, where, according to Nigerian academics, writers and environment groups, oil companies have acted with such impunity and recklessness that much of the region has been devastated by leaks. In fact, more oil is spilled from the delta’s network of terminals, pipes, pumping stations and oil platforms every year than has been lost in the Gulf of Mexico, the site of a major ecological catastrophe caused by oil that has poured from a leak triggered by the explosion that wrecked BP‘s Deepwater Horizon rig last month. May 30, 2010 | Categories:Oil | Tags: Africa, Chad-Cameroon oil pipeline, ExxonMobil, leak, Niger Delta, Nigeria, oil, oil spills | Comments Off on Nigeria’s agony dwarfs the Gulf oil spill. The US and Europe ignore it. The Hague – Hours before Shell’s annual general shareholder meeting on Tuesday, and not long after BP’s oil rig catastrophe, millions of people around the world received press releases announcing that Shell would implement a “comprehensive remediation plan” for the oil-soaked Niger Delta. The plan included an immediate halt to dangerous offshore drilling, the end of health-damaging gas flaring, and reparations for the human damage caused over the decades of Shell’s involvement. The “good news” was fiction, created by an ad-hoc activist group called the Nigerian Justice League to generate pressure on Shell to withdraw from, and remediate, the Niger Delta. According to the activists, Shell’s operations in the Delta have helped transform that area into the world’s most polluted ecosystem, which has in turn resulted in a human rights catastrophe. Shell’s public relations staff quickly and energetically moved to contain the fallout from the fake release. On Tuesday, Shell attempted to eliminate the Justice League’s spoof Shell website by complaining that it was a “phishing scheme” to the upstream internet service provider. Shell then sent a threatening legal letter to the Danish internet provider hosting the site. In a related story, the Financial Times (a blog of which, incidentally, was duped by the fake release) refused to run a hard-hitting advertisement, created and paid for by Amnesty International, that called for action against Shell for its Niger Delta legacy. Like the fake release, the ad was timed to coincide with Shell’s May 18 AGM.